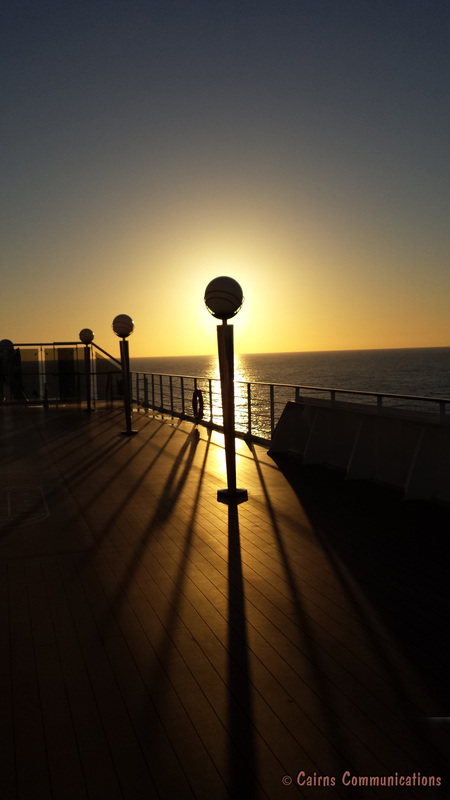 I mentioned recently that I’d done a cruise on the Sun Princess as an ‘Enrichment Speaker’ – someone who delivers educational and (hopefully) entertaining lectures on a variety of subjects. 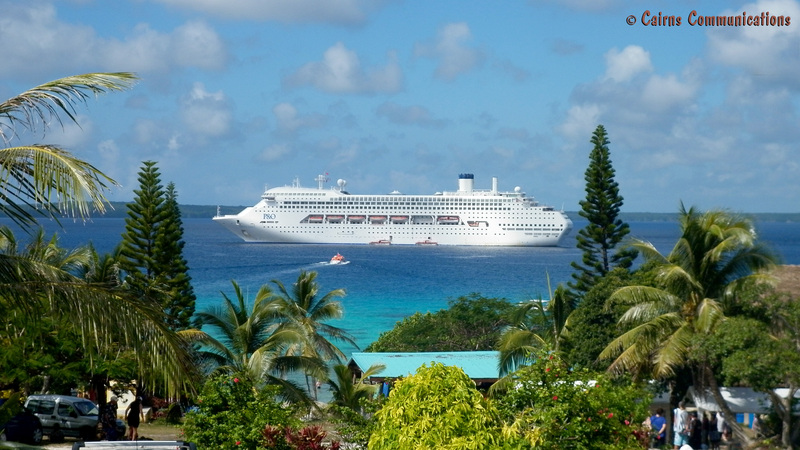 I’m often asked what my lectures were on … so here’s a part of one: Cruise Ships Past, Present and Future. 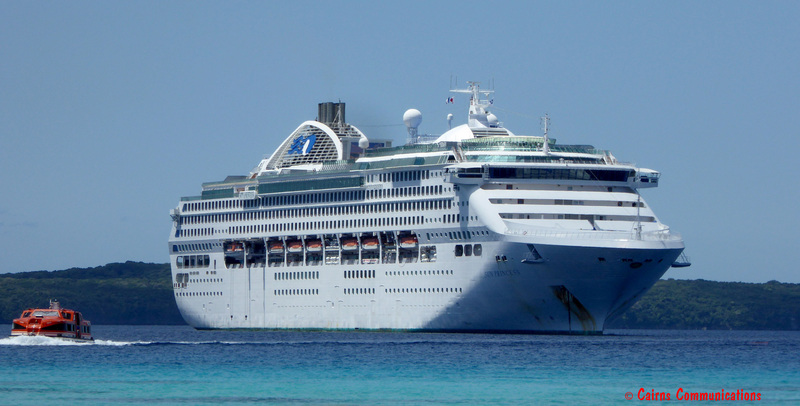 The idea of ships being used for what we would call leisure travel – or cruising – was first introduced in 1844 by the Peninsular & Oriental Steam Navigation Company, later known of course as P&O. 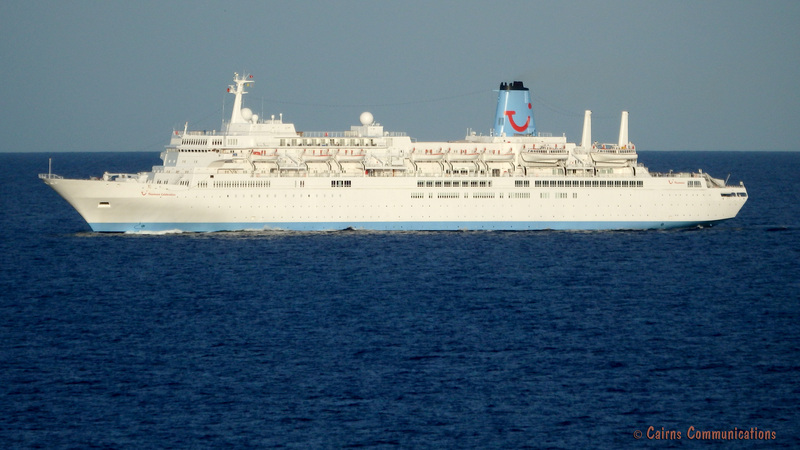 It was in that year that they started carrying leisure passengers with destination stops in Gibraltar, Malta, and Athens. Because of this, the year 1844 is considered the beginning of a new industry. Later, the company would go on to add more destination stops and more ships – from 1914 to the early 1920s, the company grew by leaps and bounds by acquiring other shipping companies and gaining their fleets. 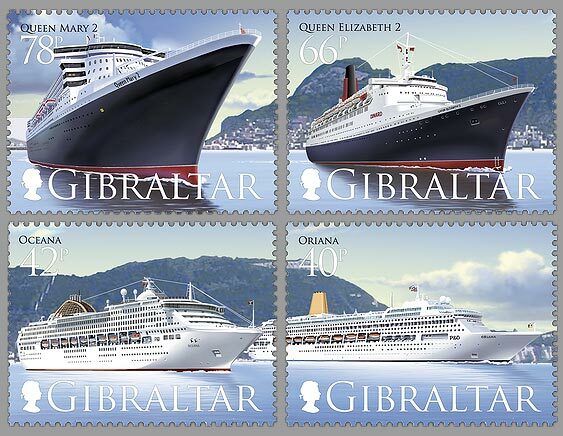 But despite the initial success of P&O, it’s a German ship that’s credited with being the first luxury cruise liner. 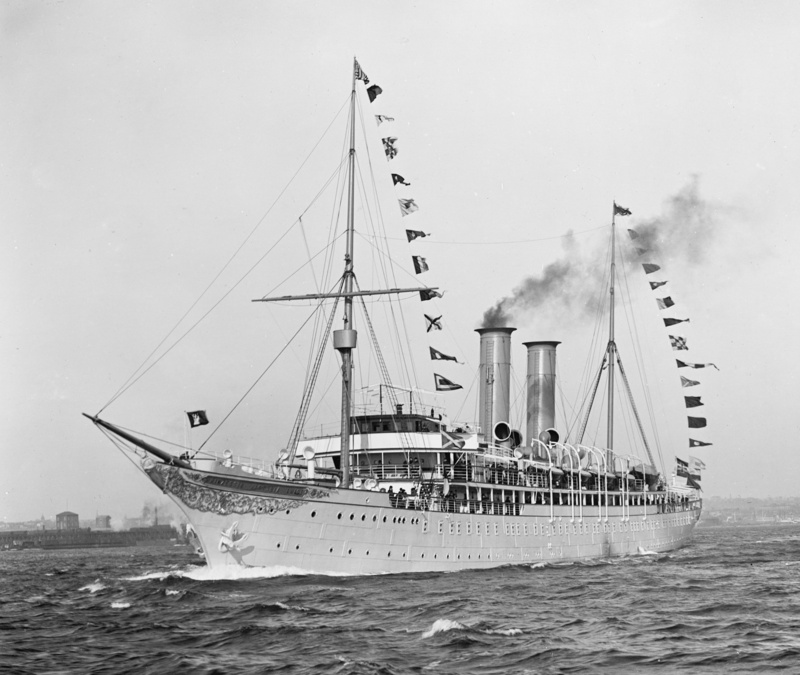 The Prinzessin Victoria Luise was completed in 1900. This cruiser set the bar for later ocean liners and cruise ships in carrying passengers to their destinations. The Prinzessin’s reign lasted only a short time since she ran aground in 1906 after a mishap with the coordinates and landmarks that were used to decipher their destination of Port Royal, Jamaica. However, her design was one that hadn’t been seen before in the shipping or cruising industries. Wanting to cater to the higher class, she was modelled after first rate yachts with all white exterior and fitted with 120 first class cabins for their passengers along with a few amenities to make their voyage a more pleasurable one. With the success of the Victoria Luise, the new industry’s leaders quickly learned the flaws in using ocean liners as cruise ships. While today we use the terms almost interchangeably, ocean liners were built with the particular purpose of transporting passengers from one place to another – almost as human cargo. They were without many onboard amenities to make the experience a pleasurable one .. those luxury items were later installed into these ships in order to cater to the crew’s new main concern: the passengers. 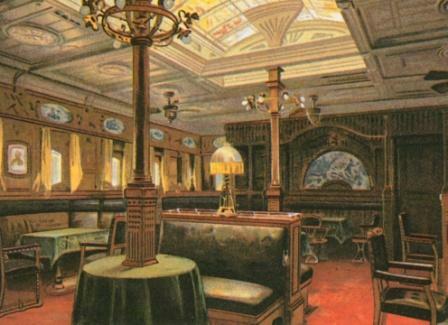 One notable examples of a luxury cruise ship was the Titanic, built in 1912, by White Star Line. This famous ship was one of three main passenger vessels for White Star and was built in response to growing competition with Cunard’s fastest ships in transporting passengers from one point to another. So the Titanic was, in many ways, both fish and fowl. She catered to some of the wealthiest of people, but also carried thousands of emigrants, searching for a new life in the United States. The ship held over 2,200 passengers on its maiden voyage- making her quite large, in historical terms – but of course most never arrived at their destination of New York. Ocean liners faced some serious drawbacks in the pleasure cruising industry. Built with their need to see their passengers from point A to point B, they focused more on getting their passengers there in the fastest possible time, and were also built to withstand the weather of all routes which usually meant enclosed decks – stopping passengers from enjoying the luxury of feeling balmy tropical climates. 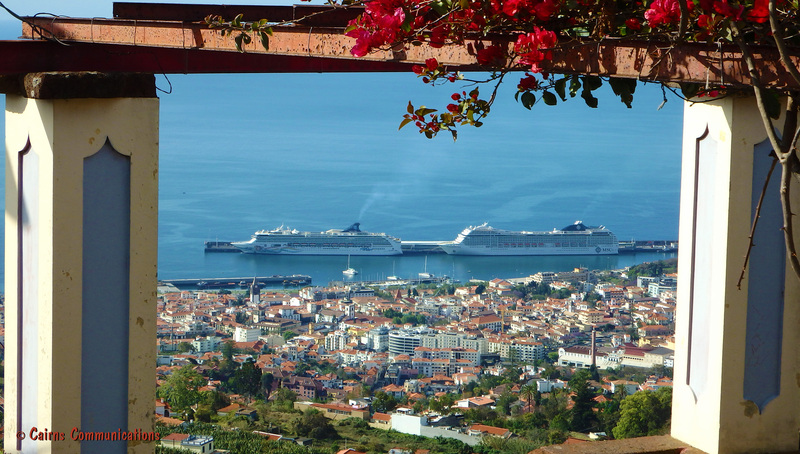 Over time, ocean liners and cruise ships have seen a blurring in their once glaring differences but some differences still remain, like the speed of their engines and the availability of open decks. Oh – and just how large are those ‘largest ships’? 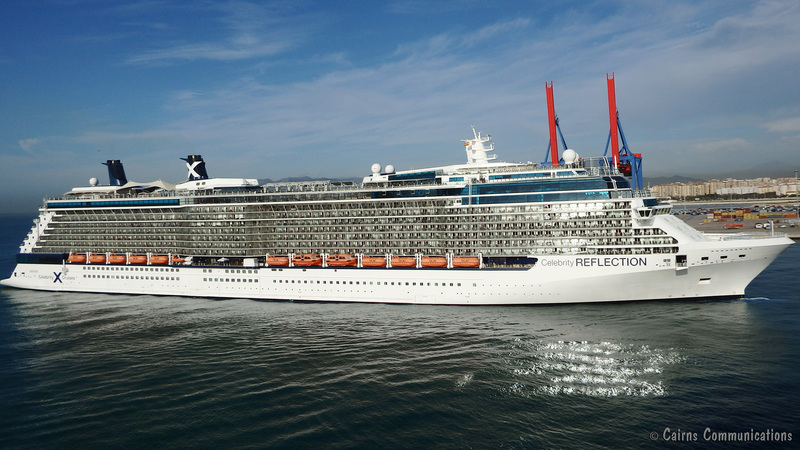 Well, the two largest cruise ships today are owned by Royal Caribbean International: the Allure of the Seas and its sister ship, Oasis of the Seas. 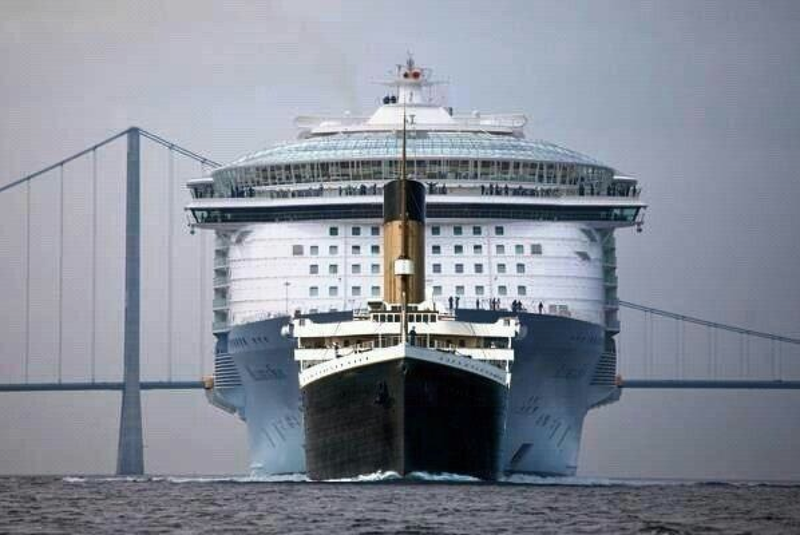 And there’s an image doing the rounds of the Internet that shows, pretty graphically, the difference in size between the Allure and RMS Titanic. It’s a photoshop, of course, and at first I thought the authors had exaggerated the difference .. but I’ve done some number-crunching and the image (though obviously a mock-up) is pretty accurate. 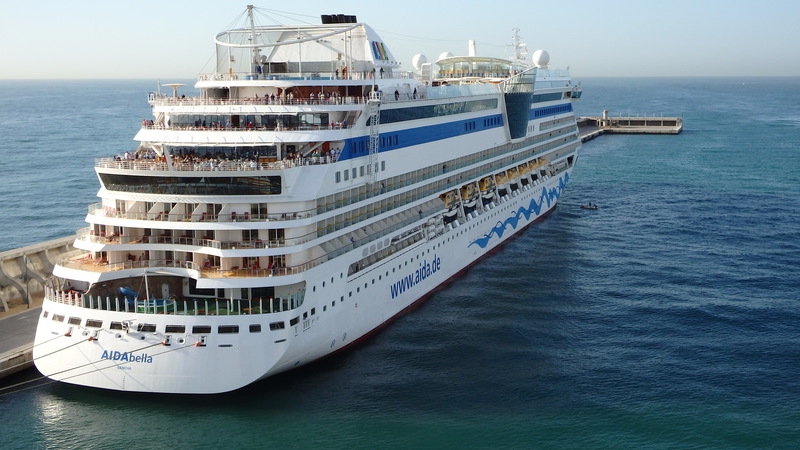 Well, it seems the cruise market’s started fragmenting again. 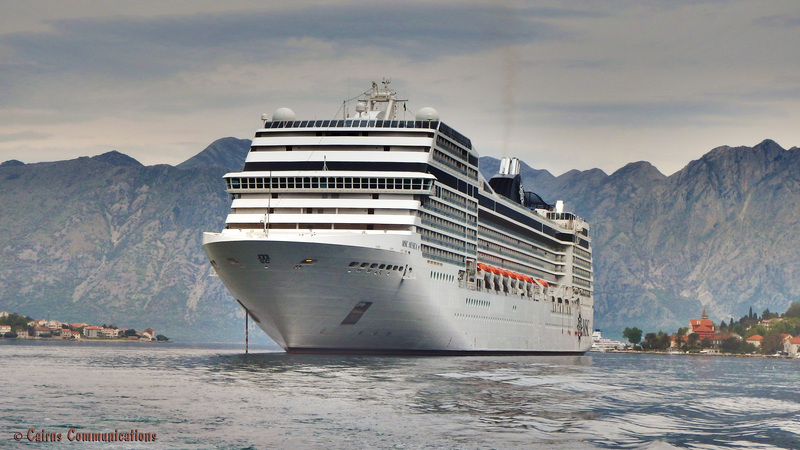 Then there’s another sector again, which I suspect may continue to grow: small-ship cruising, especially to exotic locations, more intimate ports, and using eco-friendly technology to defray costs – costs to the passenger and costs to the planet. 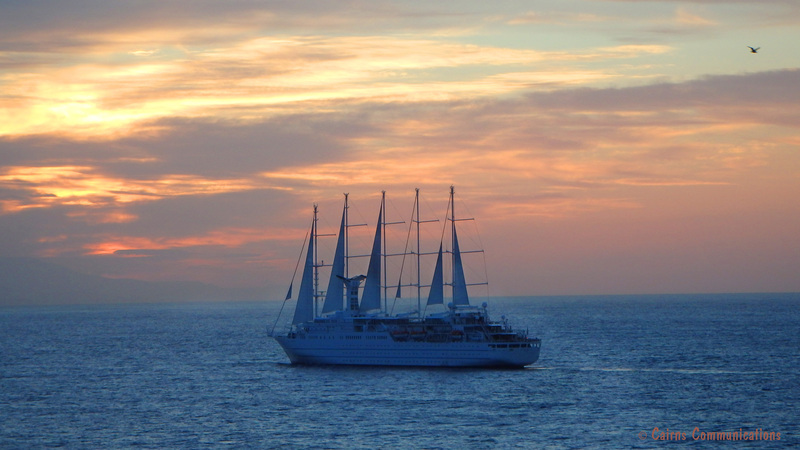 Tuesday Cruiseday – What’s a (marketing) promise worth? ← What-I-Wonder-Wednesday – How can the act, and art, of reading differ so much? Coincidentally, yesterday a friend picked me up at the port in Galveston after I got off a cruise and mentioned she had been on The Allure of the Seas. She is a very frequent cruiser (one a month) and said that ship was just too big and it seemed she was always standing in line.